CAD/CAM (computer aided design/ computer aided manufacturing) is a cutting-edge technology used to simplify the design and fabrication of various dental prosthesis including, crowns, inlays and onlays, fixed partial dentures, and veneers. This technology allows for the direct fabrication of these restorations, which eliminates the need for impression making material, models, and a dental laboratory. It also affords both the dentist and the patient the luxury of bonding the final restoration the same day the tooth is prepared. Student doctors at New York University College of Dentistry (NYUCD) have the opportunity to use CAD/ CAM technology to design and fabricate tooth colored restorations for their patients[1,2]. CAD/ CAM technology has been an integral part of the NYUCD curriculum. 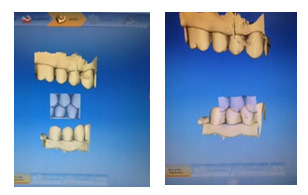 Student doctors currently use CEREC’s® Blue Light LED acquisition and milling unit. The current educational protocol for the clinical utilization of this technology is twofold. First is an introductory lecture presentation outlining the procedural steps from taking the optical impression to designing the final restoration. This is followed by a hands-on session during which each student goes through this process using the acquisition unit on a typodont tooth they had previously prepared[3-5]. These sessions were supervised by trained faculty doctors. Recently NYUCD has incorporated a new video platform system to record lectures for students called Mediasite by Sonic Foundry®. Mediasite® is an automated system that allows for the creation and management of video presentations and lectures. In order to maximize learning, a video presentation was produced using Mediasite® and made available for student doctors to view in order to review procedural steps for designing and fabricating an indirect restoration using CAD/ CAM technology. The video is a recording of the instructing doctor’s presentation of CAD / CAM technology to train faculty doctors. Faculty doctors in the audience were encouraged to ask all questions at the end of the presentation in order to maintain order while recording this informative presentation. By employing Mediasite’s® recording option, the screen of the acquisition unit was recorded, while a separate camera recording was taken of the demonstrating faculty doctor’s actions. This method allows the student doctors to watch both the actions of the demonstrating faculty doctor and the screen of the mobile unit simultaneously for a cohesive understanding of the procedure. Mediasite® allows for a recording to be edited to eliminate background noise and interferences, which ensures a clear and concise video. The training video demonstrated both Biogeneric Copy Mode and Biogeneric Individual Modein adherence to NYUCD protocol. 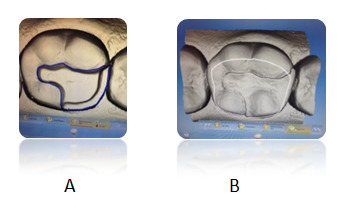 When using the Biogeneric Copy Mode, a direct technique is utilized and the restorations such as inlays and onlays can be milled and inserted in one visit (Figure 1). Biogeneric Individual Mode is used at NYUCD to indirectly create crowns for anterior teeth and premolars, as well as inlays and onlays. NYUCD educational protocol for Biogeneric Individual Mode requires a final impression and Die-Keen stone model of the completed preparation, which is then scanned to make a digital impression (Figure 2). When utilizing either Biogeneric Individual or Biogeneric Copy Mode, a standard protocol for entering patient cases is the same. When adding new cases, the student’s initials are entered under the “Patient’s name”, and the student’s initials and tooth to be restored are entered as “Patient’s ID”. This method ensures that the cases are tracked correctly while maintaining patient confidentiality. Next, the mode to be used for designing and fabricating the restoration is selected. For this training video, the Biogeneric Individual Mode was chosen. The next step is to select which tooth is to be restored. The initial digital impression is then taken of the Die-Keen stone model that was made from the impression of the prepared tooth. The proper technique for application of titanium dioxide spray is demonstrated. After the final optical impression is taken, one can proceed with the design process. Figure 1: Biogeneric Copy Mode. Onlay preparation and digital impression made for tooth # 30. A: Finish line marked to continue in fabrication of onlay. Figure 2: Biogeneric Individual Mode establishing occlusion between the optical casts of the preparation cast and the counter cast. The optical cast was placed on the virtual digital arch and the Curve of Spee and Curve of Wilson are set. Next, the digital cast is trimmed using the trimming tool. A double click initiates an action and single clicks direct the line designating the portion of the cast to be trimmed; a double click terminates the action. Following trimming is the selection of the finishing line or margin. Similarly, a double click initiates the start of the finishing line placement, followed by single clicking to place a finish line of where the restoration will encompass the prepared tooth and a double click ceases the placement of the finish line where it began. After the finish line is completed, the restoration’s path of insertion is verified to ensure that there are no undercuts present. The restoration is digitally proposed. At this time, the student doctor has the ability to analyze the restoration utilizing various options and make adjustments as needed. There are several different ways to approach and analyze the restoration. Student doctors are shown the different tools available and the function of each tool. They are first shown how to use the “View Options” tab where different views are available to focus on the restoration. Next, the “Tools” function is demonstrated which allows the student to adjust the form, move the restoration, shape the restoration, and adjust the contacts. Students doctors are taught how to increase or decrease the opacity of the digital model or to remove the model to view the restoration alone, observe the minimal thickness of the restoration, increase or decrease the opacity of the restorations and to observe the trimmed model using “Display Objects”. Finally, student doctors are taught about the “Analyzing tool” where they can view the contacts, change the color of the model, and utilize cursor details. Cursor details are emphasized in the training video to encourage students to utilize this modality to self-assess the depth of their preparation indirectly by analyzing the thickness of the restoration. After the restoration is thoroughly analyzed, a student doctor can then proceed to mill the restoration. In today’s society, doctors and patients alike consult the internet for videos and tutorials to understand and gain knowledge in various areas of science and health. The current generation of student doctors turn to the internet to research different areas of dentistry in order to get a better understanding of the procedure they are about to perform. They often use YouTube or other online video sites as an easy and efficient way to supplement their dental education. Although this may often be beneficial in gaining knowledge of a certain procedure, it may also be detrimental. Dentists and other professionals posting on YouTube or similar sites are not checked for accuracy /quality or held to a certain standard of care, which may mislead a student doctor relying on these resources. Many student doctors at NYUCD would research CAD/CAM training videos on YouTube prior to utilizing the technology in patient care, having forgotten much of what they learned during the training sessions. Search results often yielded video posts by doctors using older CAD/ CAM technology, or methods not supported by the College’s clinical curriculum. This would often result in the student doctor learning improper technique. In order to avoid the confusion and misinformation obtained by many students seeking help using CAD/ CAM technology online, it became evident that an NYUCD training video was necessary. The training video was recorded and placed on Mediasite® making it available for all of NYUCD students and faculty doctors to watch. By creating this training video, the need for student doctors to search elsewhere for information to refresh their memory and potentially learn improper technique is eliminated. Additionally, the training video was created showing the newest software for the current Sirona CEREC Blue CAD/ CAM system, which ensures the student doctors are receiving training on current technology. Having the capabilities of Medisite® to create an educational video has many advantages. Students viewing the educational video prior to using the CAD/ CAM unit allow them to be more comfortable with its interface and many features. Therefore, when students use the technology for the first time during the training sessions, they will benefit more from the laboratory experience because of their background knowledge. Thus, the student’s time practicing and using the unit is more efficient, and faculty doctors can assist students in perfecting their use of the CAD/ CAM technology as opposed to familiarizing them with it. Student doctors also have the ability to review the video in order to refresh and retain more information about the CAD/ CAM Biogeneric Individual and Biogeneric Copy Mode procedure prior to clinical use. This may encourage more students to utilize the technology in the clinical setting because they are more confident in the procedure after viewing the video and re-familiarizing themselves with the technology. The need for student doctors to look online for at potentially irreputable sources for information that could possibly lead to improper technique and usage of CAD/ CAM technology is eliminated. Producing this educational video will help student doctors be more confident and competent in treating patients utilizing CAD/ CAM technology. 1. Wittneben, J.G., Wright, R.F., Weber, H.P., et al. A systematic review of the clinical performance of CAD/CAM single-tooth restorations. (2009) Int J Prosthodont 22(5): 466-471. 2. Rekow, E.D. CAD/CAM in Dentistry: A Historical Perspective and View of the Future. (1992) J Can Dent Assoc 58(4): 287-288. 3. Debartolo Angela, M., Michele, H.H., Vignola, S.C., et al. Training Program Implemented to Empower the Faculty and Student's Learning the Current CAD/CAM Technology. (2015) Journal of Dentistry and Oral Care 1(3): 1-3. 4. Lee, K.H., Yeo, I.S., Wu, B.M., et al. Effects of Computer-Aided Manufacturing Technology on Precision of Clinical Metal-Free Restorations. (2015) Biomed Res Int. 5. Nejatidanesh, F., Shakibamehr, A.H., Savabi, O. Comparison of Marginal and Internal Adaptation of CAD/CAM and Conventional Cement Retained Implant-Supported Single Crowns. (2016) Implant Dent 25(1): 103-108. 7. Mukhopadhyay, S., Kruger, E., Tennant. M. YouTube: A New Way of Supplementing Traditional Methods in Dental Education. (2014) J Dent Educ78(11): 1569-1571. 8. Jaffar, A.A. YouTube: An emerging tool in anatomy education. (2012) Anat Sci Educ 5(3): 158-164.